Fully illustrated accounts of fossil fishes are given by Long (1995) and Maisey (1996). The diversity of living fishes is covered by Nelson (1994), and Kocher and Stepien (1997) present papers on the molecular system-atics of fishes. Detailed reviews of the sharks and their relatives from the Palaeozoic and post-Palaeozoic are given by Zangerl (1981) and Cappetta (1987) respectively, and of holocephalans by Stahl (1999). The latest overviews of the phylogeny of many chondrichthyan and osteichthyan groups are given in Stiassny et al. (1996), and Arratia and Schultze (1999) is a good collection ofpapers on Mesozoic fishes. Broad introductions to Chondrichthyes and Actinopterygii may be found at http://www.ucmp. berkeley.edu/vertebrates/basalfish/chondrofr.html and http://www.ucmp.berkeley.edu/vertebrates/actino pterygii/actinofr.html and detailed cladograms at http://www.geocities.com/kajejenson/chondri chthyes.html and http://tolweb.org/tree?group= Actinopterygii&contgroup=Gnathostomata. Learn more about the three-dimensional anatomy of modern cartilaginous and bony fishes at http://digimorph.org/ listbygroup.phtml?grp=fish&sort=SpeciesName. For the fish fanatic, 'welcome to the world of fishes' at http://www.fishbase.org/home.htm and everything you ever wanted to know about sharks at http://www.elasmo.com/. Read about an excavation of new Leedsichthys specimens in 2002 at http://www.nerc.ac.uk/publications/planetearth/pe-autumn02.shtml. 1 How did the dinosaurs live? 2 Why did the dinosaurs become so diverse? 3 What are the relationships of theropod dinosaurs to each other and to birds? 4 Did dinosaurs have feathers? 5 What was the largest dinosaur? 6 Why were the ornithopod dinosaurs so successful? 7 Were the dinosaurs warm-blooded or not? 8 How did dinosaurs grow up? 9 How did the pterosaurs fly and walk? 10 What do we know about the ancestry of modern turtles, crocodilians and lizards? 11 Did snakes evolve from swimming or burrowing ancestors? 12 How were plesiosaurs and ichthyosaurs adapted to underwater life? 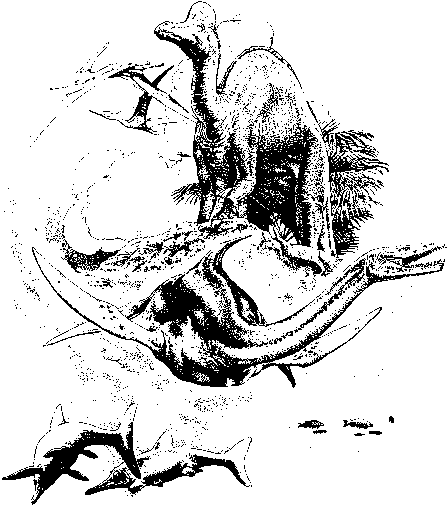 13 Why did the dinosaurs, pterosaurs, plesiosaurs and ichthyosaurs die out 65 Myr ago?